I'm super busy getting ready for this weekend's Open Farmhouse Event that my friends and I are throwing. It is shaping up to be a great day - weatherwise and culturewise. I'll pop back in tomorrow to share a little more. Here are some of the pieces of pottery that I will be selling - just a bit of a sneak peek. 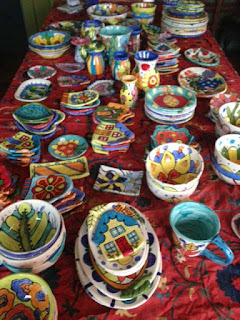 There is still more in the kiln. I will be also selling a whole bunch of other things - notecards, paintings, pillows, and a bit of yarn. The Farmer will be outside peddling our farm raised lamb. And my friends will be selling things too. More about that tomorrow. We have a Facebook event page HERE if you would like to look. And here we are on Google Maps. 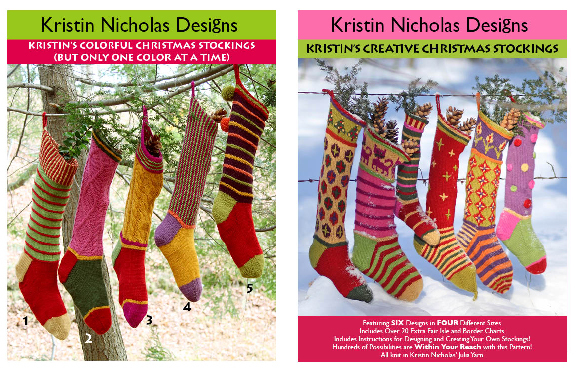 Hi Kristin - I've had your Christmas Stocking patterns for a couple of years, now. I had trouble with the color work, so I took a Craftsy class. 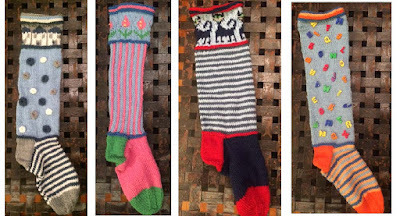 I also took a sock class at my local yarn store and knitted 2 pairs of socks to prepare to make my stockings. I had my family members choose their 2 favorite colors and then incorporated those colors into their stockings. So far, I've made 9. I'm celebrating Christmas at Thanksgiving this year, as that will be when my brother (living in Omaha) and I (living in Savannah) will converge on our hometown in WV. Thank you for the lovely patterns. I really enjoyed making them. I hope my family will celebrate with them for years to come! Wow! Not only was Leann inspired, she went totally crazy with my pattern Kristin's Creative Christmas Stockings. She sent me photos of each stocking and notes about each design she modified. Leann took the challenge and combined the different charts and ideas in the pattern to make each design her own. I love to see what other people do with my patterns. It isn't often I get photos and I am not much for poking around on Ravelry. But this made my day. Thank you to Leann for making my Thanksgiving Holiday extra special with the thoughts of her and her family celebrating an early Christmas and Leann handing out the stockings. And I love that Leann let them choose their favorite colors and she worked the designs around their likes. Awesome! or on Ravelry here and here. Here are the cover shots of both the patterns. Each includes several different variations and sizes. I wish I could come to your open house. I hope it is succesful!! Anyhoo, *GOOD LUCK* with the EVENT! Hope the ELVES survive the "TOURISTS"! Your pretty makes such a gorgeous statement all together on the table like that. I wish you great success at your own house. Wish I was close enough to come! Wow the Christmas stockings are awesome. I wonder if I start in January if I could make enough for my family.....I'll have to think about that. Best of luck with your Event this week-end. Sure wish I was close enough to attend. I'll be watching for pictures next week.